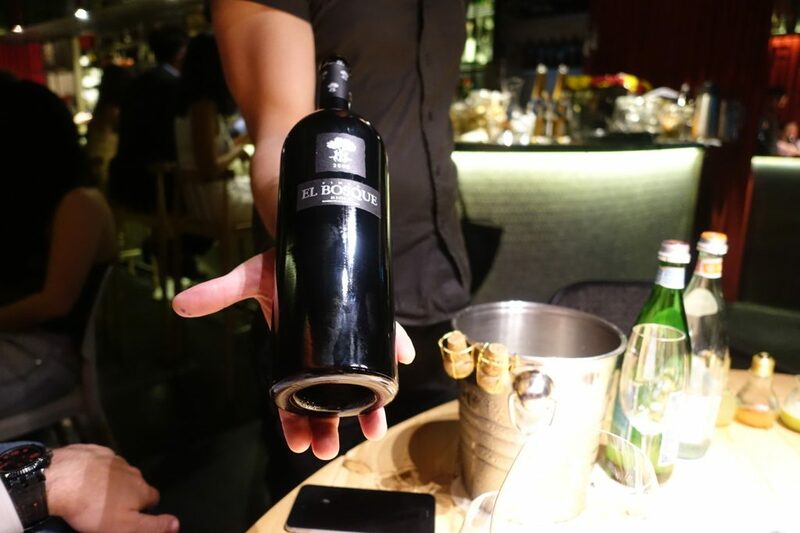 FOC Restaurant in Singapore was launched in September 2014 with the mission to bring us diners an experience of contemporary Catalonian cuisine with a forward thinking craft cocktail menu. 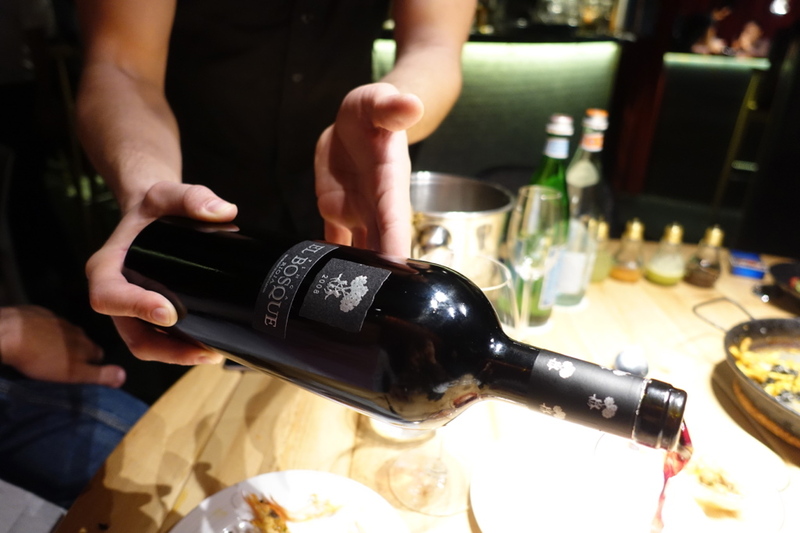 It’s a partnership between Catalonian chef-restaurateur Nandu Jubany who owns Can Jubay (Michelin star’d for over 20 years), local chef Jordi Noguera, and the much revered mixologist Dario Knox. 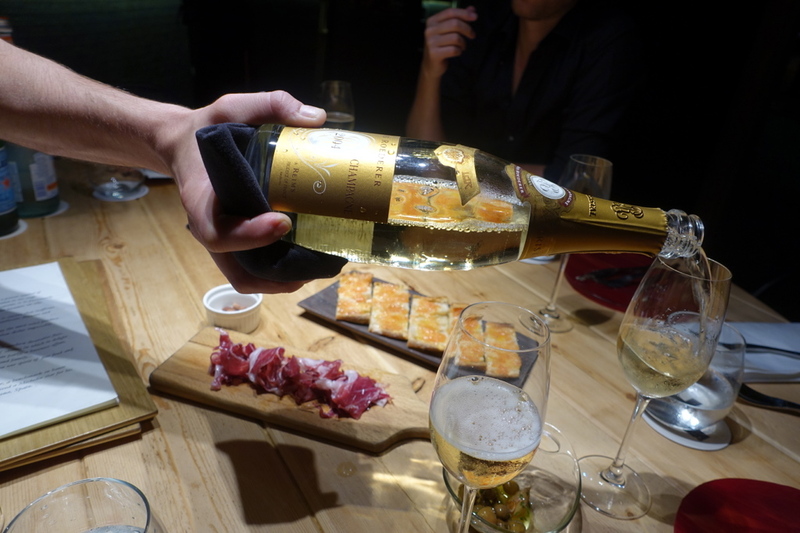 The name “FOC” is Catalan for “fire” and the restaurant has the motto of “Fine Fun Food from Barcelona”. 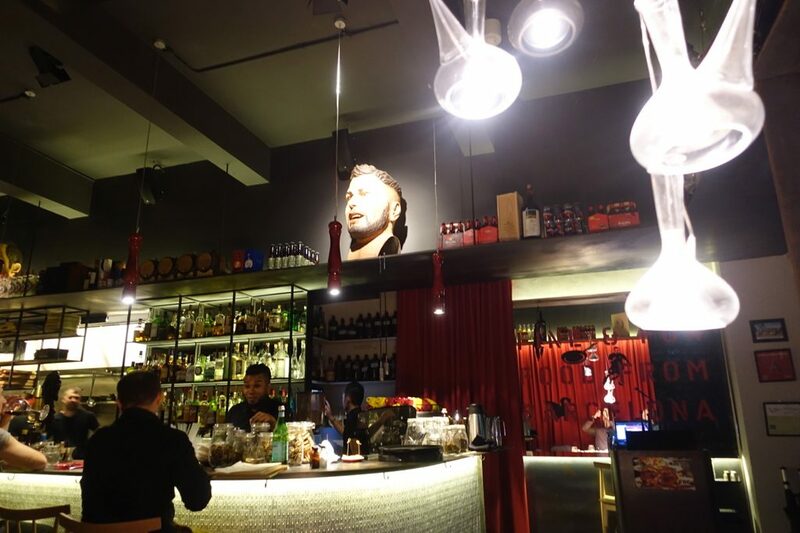 Inside has an open kitchen, is full of quirky Spanish pop culture cues, papier-mâché masks, private alcoves, comes with counter dining areas with full view of the cocktail making theatrics. 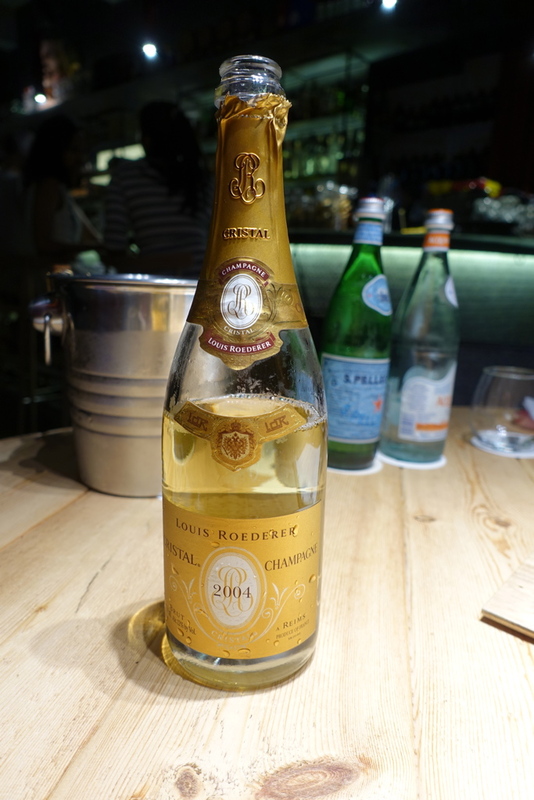 Louis Roedere Crystal to celebrate a very special occasion of coming to SG and celebrating a friend’s 40th. Any excuse will do! 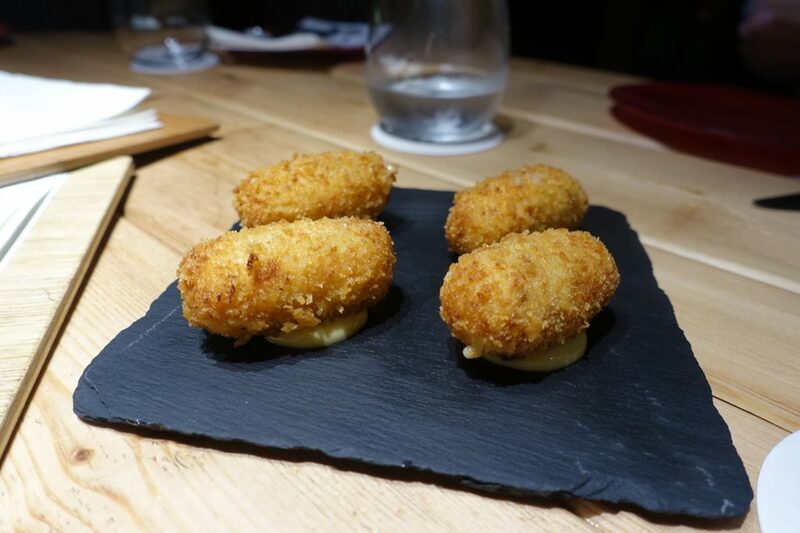 Ham croquettes $10 (four pieces) came with a nice creamy rue centre with a nice amount of jamon but were lukewarm. Toasted bread with tomatoes $8 (for five pieces) were ok, not a patch on Barranfina’s though. 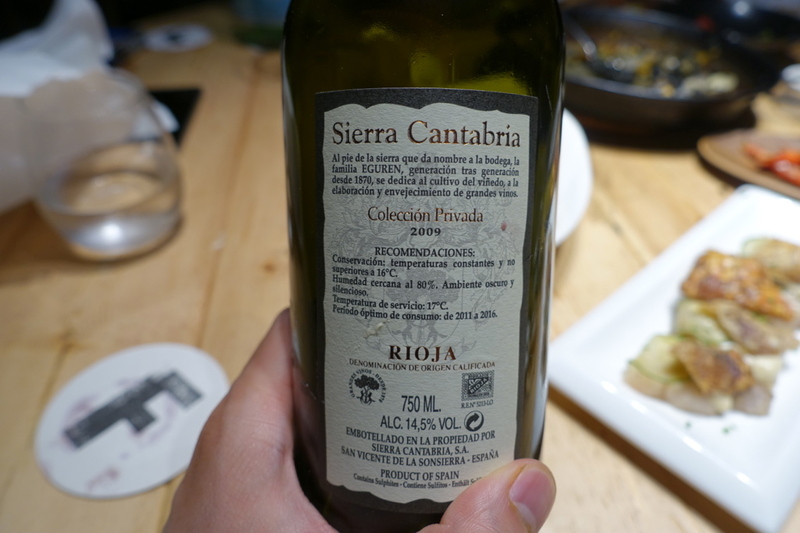 Easily forgettable sadly, perhaps this was down the lack of flavour and the unremarkable crisp bread. Some sour dough would have gone down a treat with richer flavoured tomatoes. 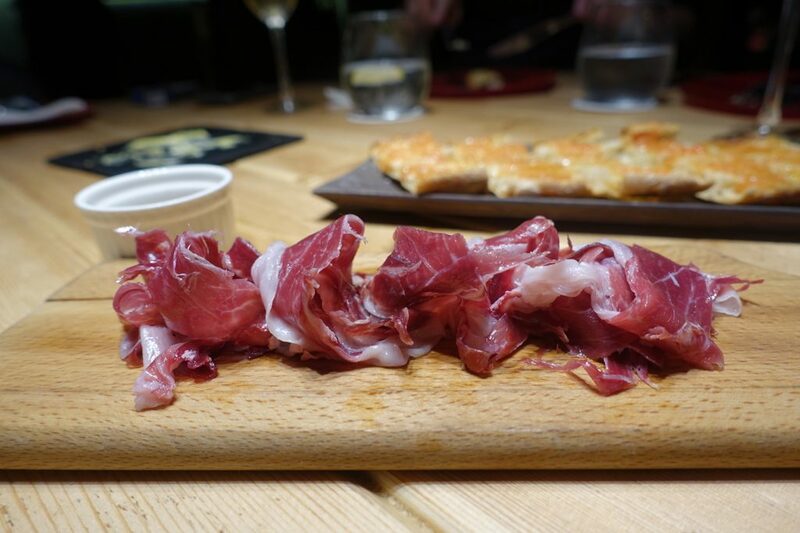 Ibérico ham $30 had good flavour but didn’t have the buttery mouth dissolving qualities of some others I’ve had. It was more on the chewier side. Perhaps thinner cutting would have made the difference. 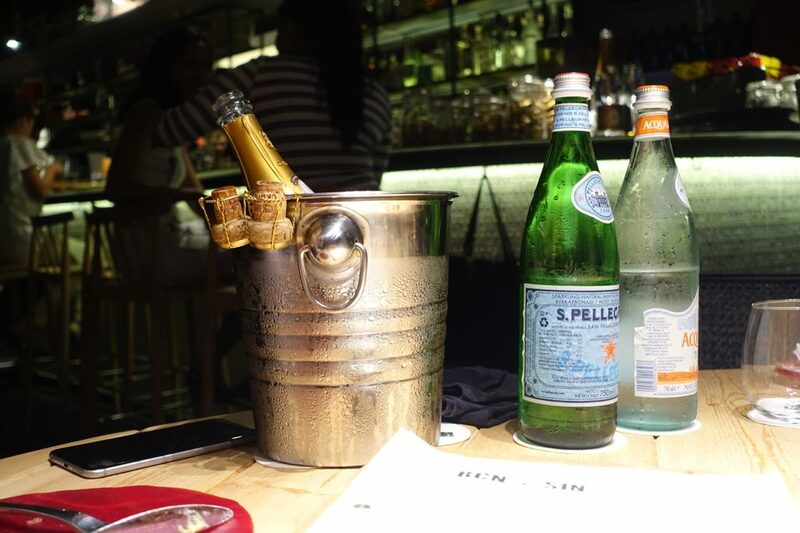 The posh booze was free flowing constantly! Padrón and piquillo peppers plate $12. 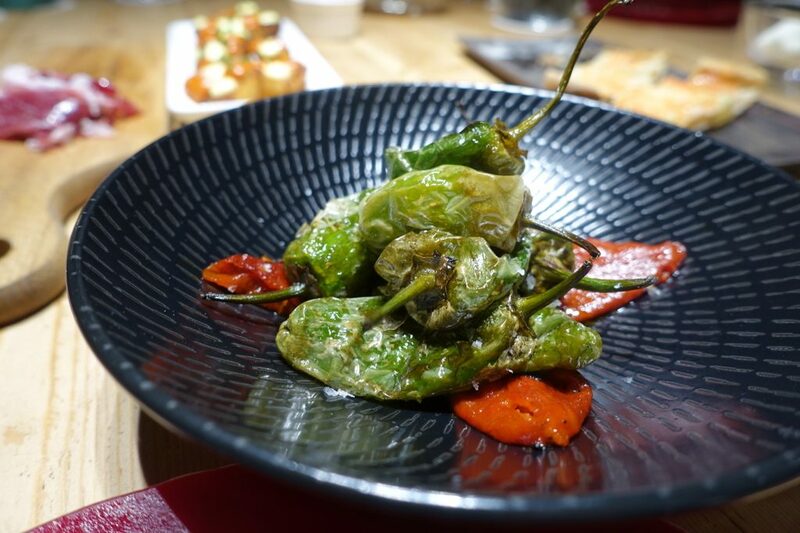 Call me pedantic but I like my padrón peppers plump with not too much frying. These one’s had too much time in the sun I reckon. 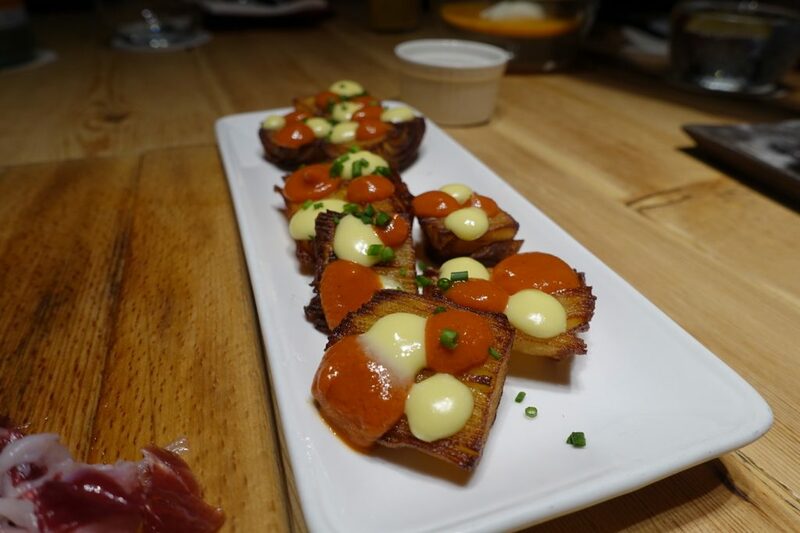 Patatas bravas – FOC style $8. 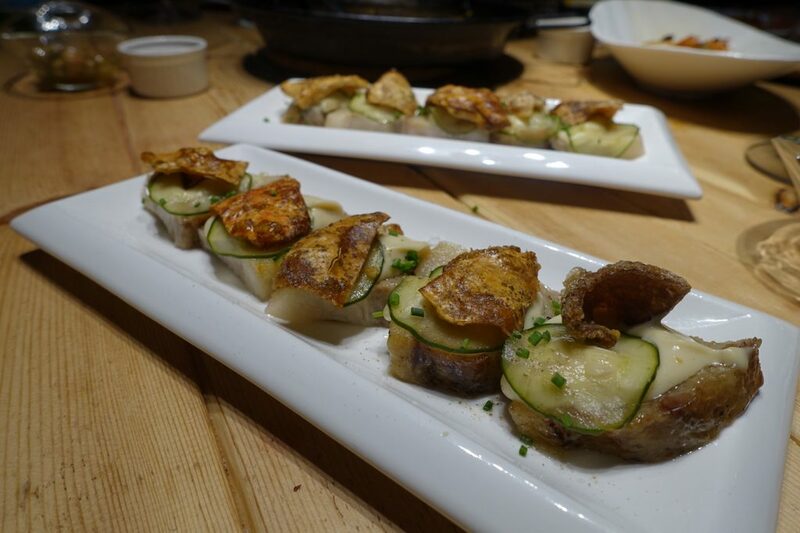 Terrine in style with piped aioli and spicy tomato sauce – the potatoes were pimped for sure. Somehow though they looked much better than they tasted. I’d expected crispy potato from how they looked but they cold and soft. Watermelon “Gazpacho” & Smoked Olive Oil Ice Cream $12. In the Singaporean humidity, scrap that in any climate this dish would be a bonafide gem. 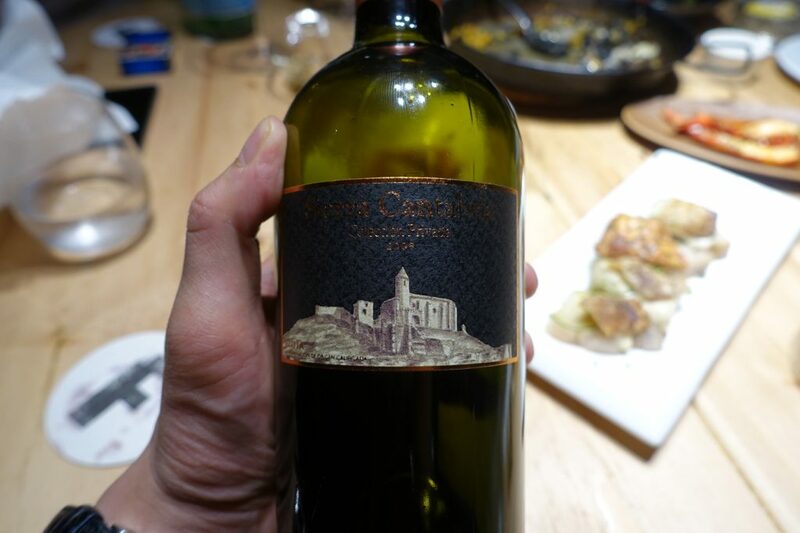 Refreshing, full of flavour and delicious to the last drop. I’d happily say that if you don’t order this you will miss out. Fresh Oyster with ponzu, escabeche with some other concoction with sake, lemon and butter. 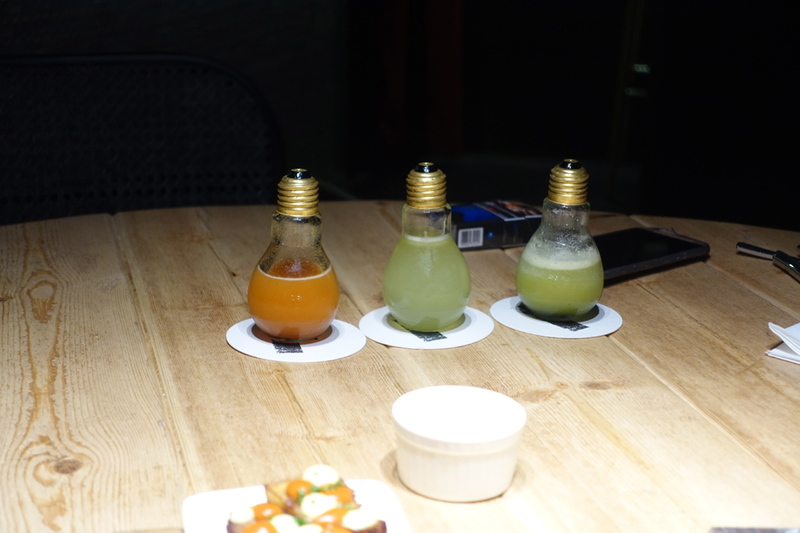 FOC’s own innovative interpretations of sauces encapsulated in light bulbs – I loved the notion! 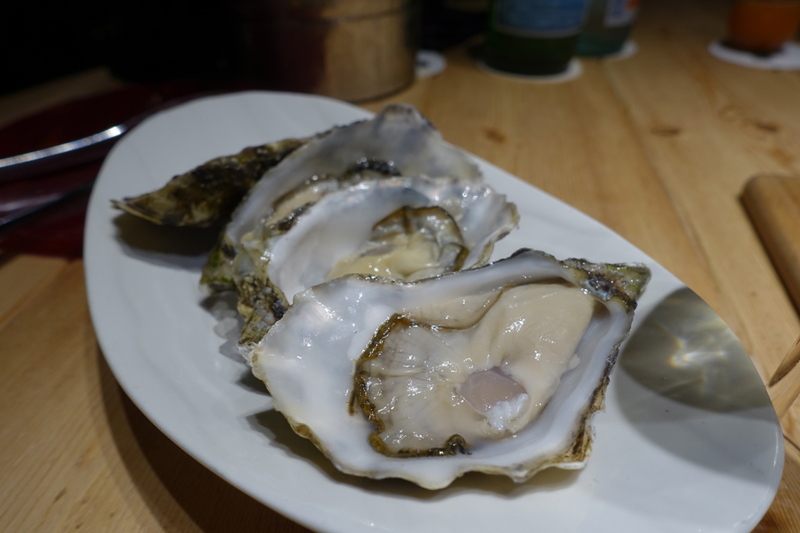 The oysters were brilliant things to eat too with those balanced acidic condiments. 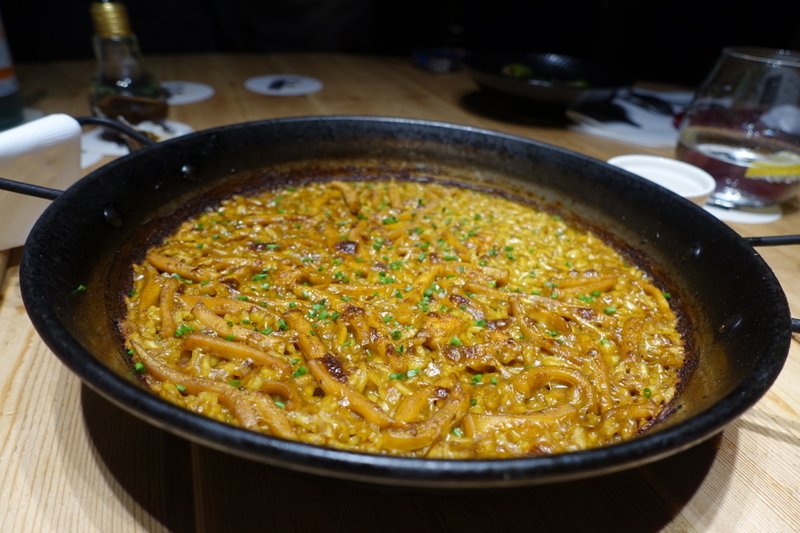 Cuttlefish & Saffron Paella $30 – oven cooked to a pan sticking deliciousness. Isn’t this the only way to cook paella? The cuttlefish was as tender as can be too amongst the roasty-toasty rice. 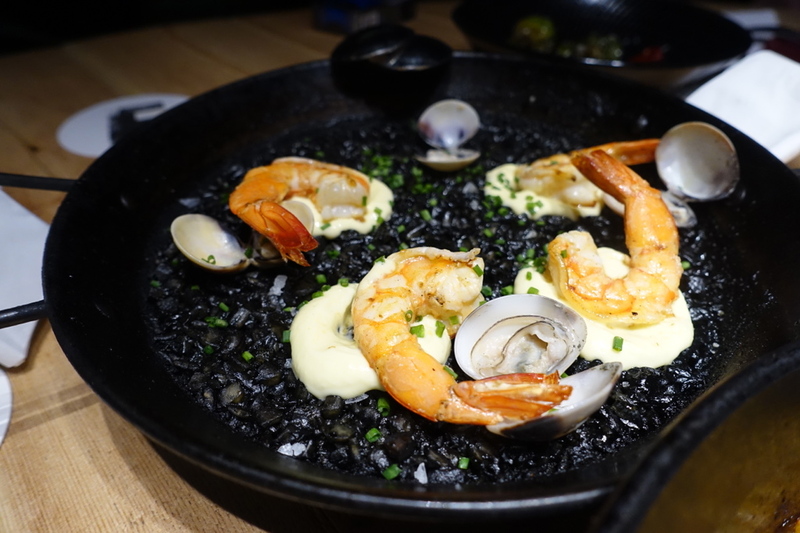 Black Mediterranean Squid Ink Paella $24. Nice work here too, they seem to do paella good here with tonnes of flavour and rice with a good amount of bite. The token clams were more decorative more than for any else substantial and those prawns didn’t need to swim in that aioli. Octopus Galician style -Slow Cooked & Charcoal Grilled $22. 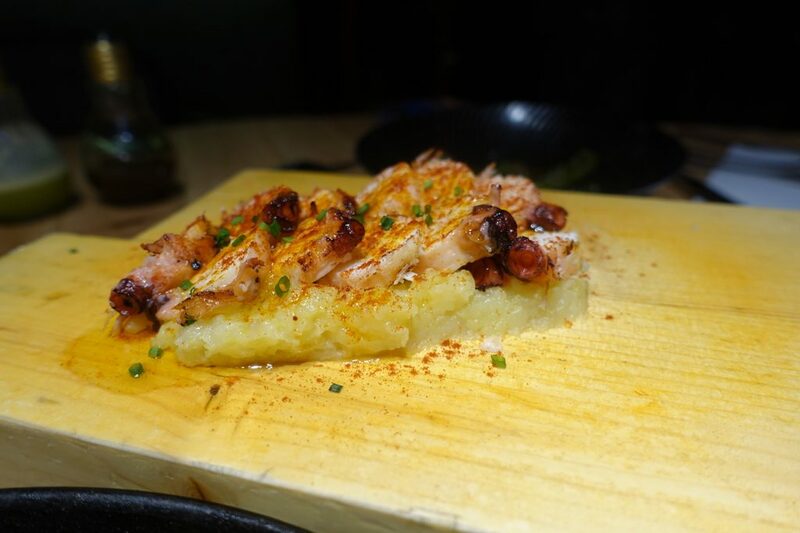 Buttery tender octopus worked really well with the mashed potato. 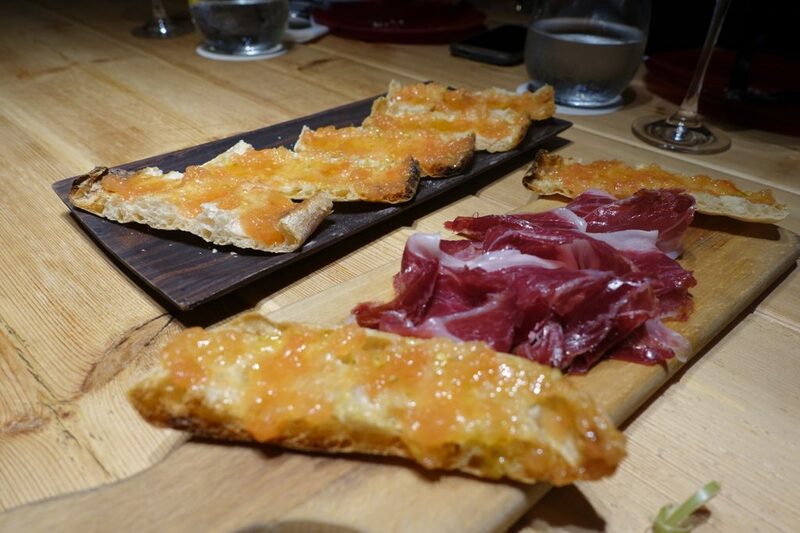 This dish stood out and for me the quintessential tapas dish that I must order everything I see it. 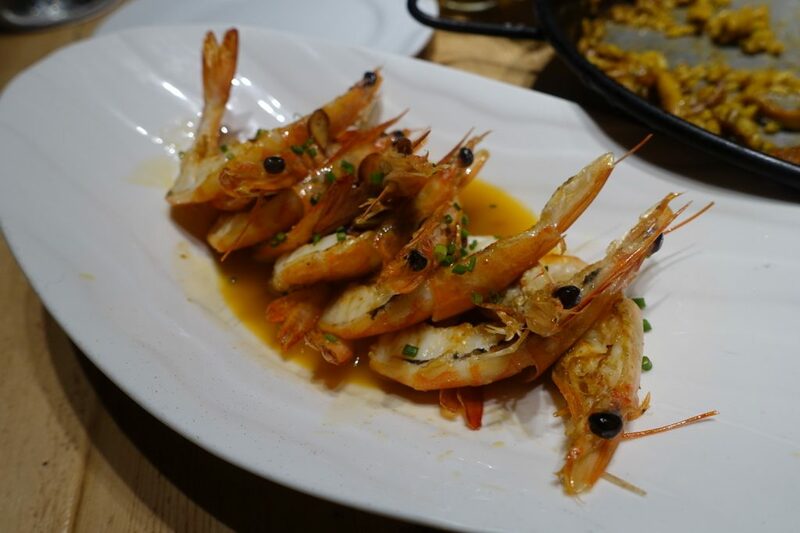 Prawns in “Ajillo” sauce $22. They seemed over cooked and tough to eat especially with the digestive tract still in place. Meh. 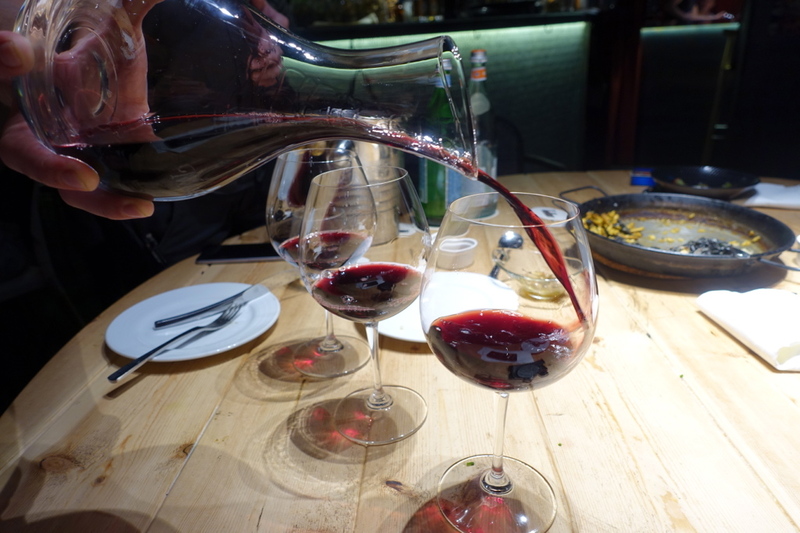 The wine seemed to be free flowing throughout the meal and FOC has a stellar selection. Grilled Scallops with Soy Caviar & “Bonito” stock $16 (2 pieces). If you like umami then look no further, this mouthful had it in spades. 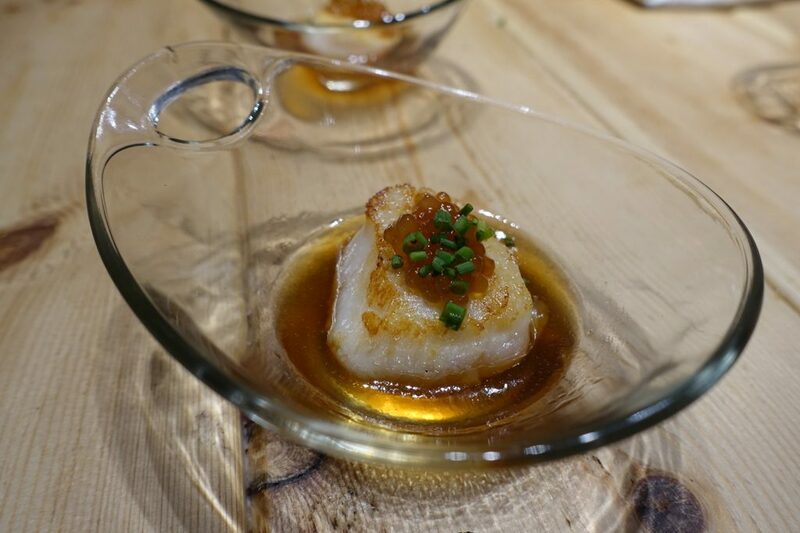 It was a queen of scallops, what a lip-smackingly good dish. Onto the next round of red wine for the steak. 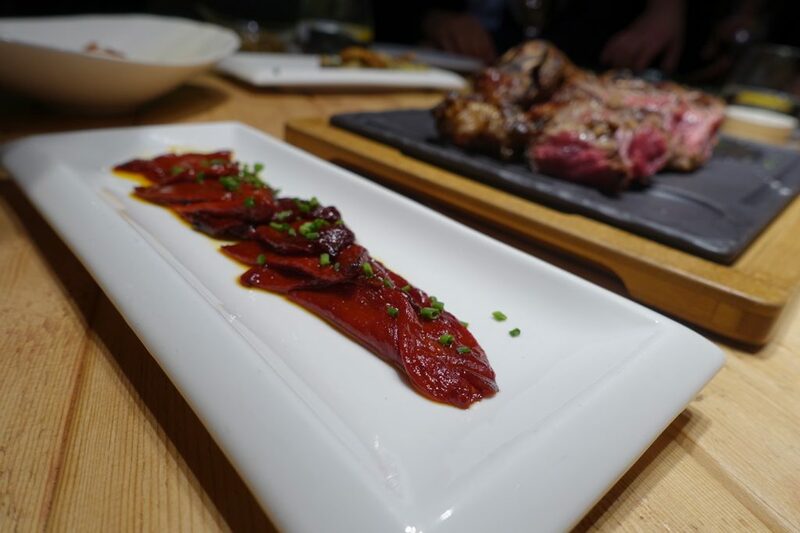 The grilled “Chuleton” ribeye steak with piquillo peppers ($35+ for 150g) fresh from the josper grill was anti-climatic as it left us chewing for days. The famed tenderness of the ribeye just wasn’t there. Sadly it had to be sent back. 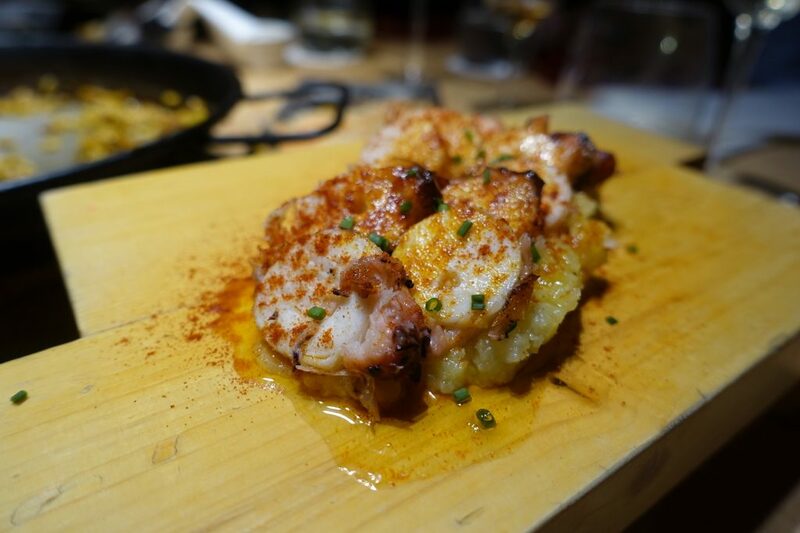 Grilled Red Prawns ($25+). 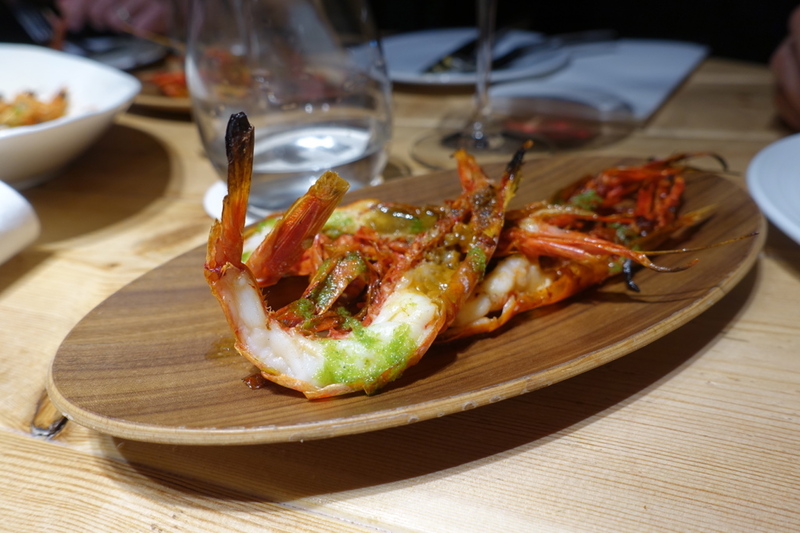 I saw them on the menu and had to have it as I’m a huge fan of Carabinero prawns which are famed for the flavour and size. These though weren’t related as from what I could see they were scrawny cousin that hadn’t had a feed in weeks. 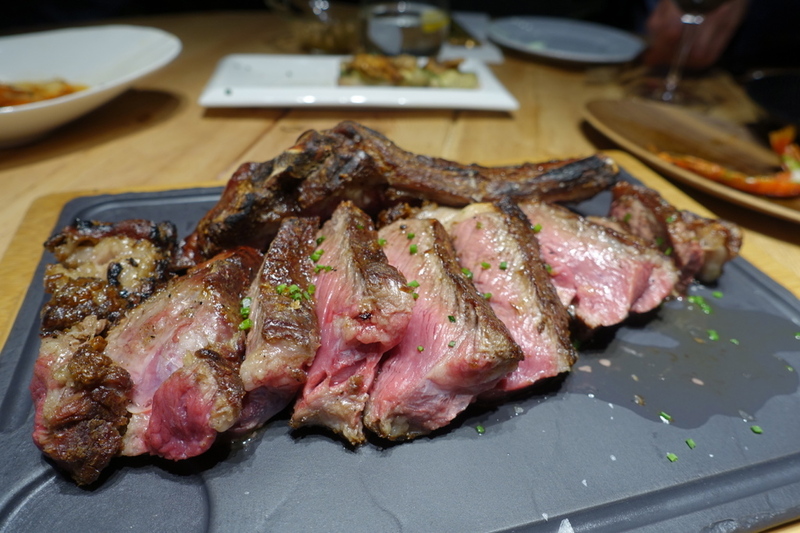 From the char they seemed to be flamed on the josper grill which made them dry and uninspiring. Perhaps cooking them whole not halved would have retained the moisture. Confit pork belly with cauliflower purée $14. 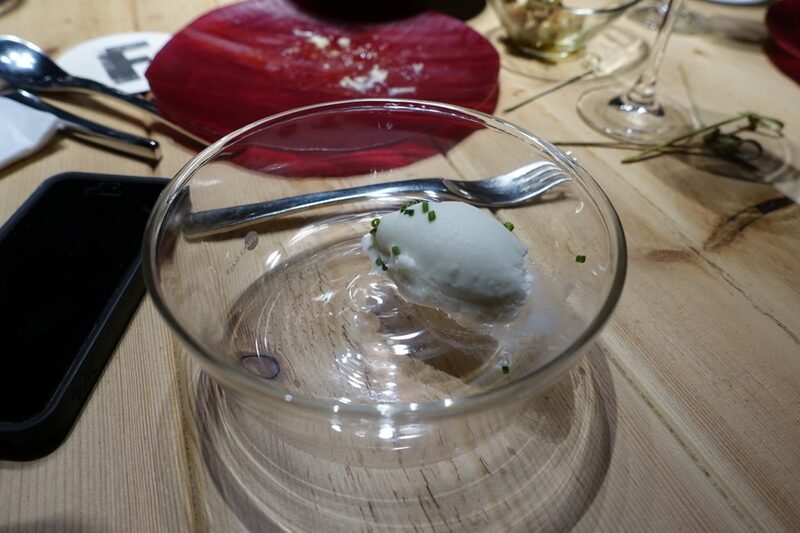 Hunks of fat, with zero or next to nothing protein, bland cauliflower purée – not a fan at all me. The only godsend was the crispy crackling. Birthday boy gets a chocolate brownie treat to end off the meal. The good: There were some treasures here especially with the gazpacho, octopus and scallop so I persevered with the other dishes but to no avail. 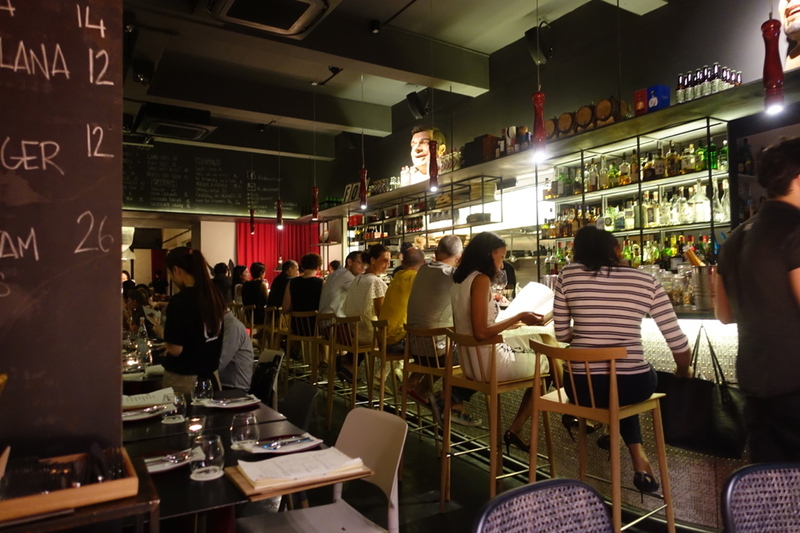 FOC seems to have a pedigree though so going back may mean less mistakes and a stronger dining experience. 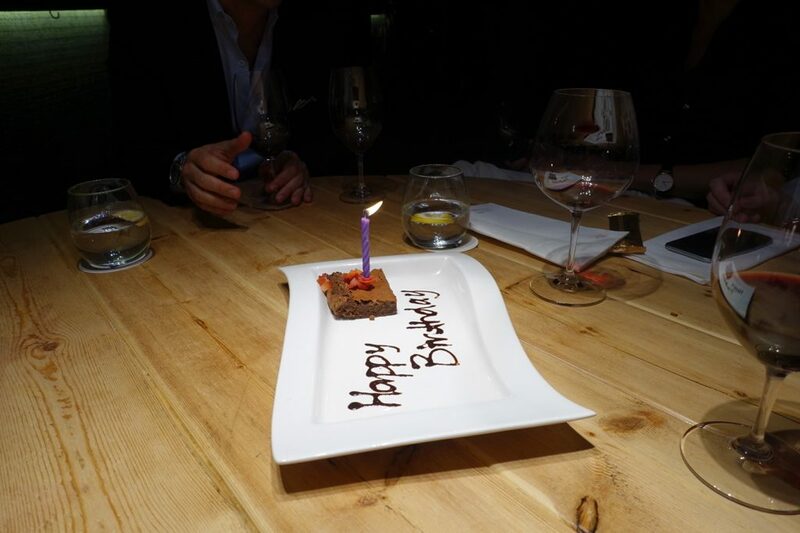 One thing to note too our waiter was superb, he knew his stuff and returned our steak with zero quibbles. Oh and the atmosphere was top notch. 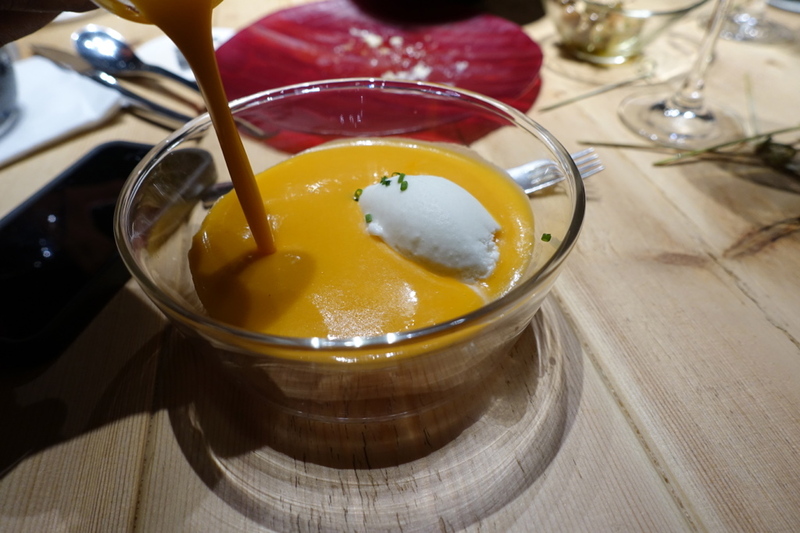 The bad: It was a hit and miss experience, some magic with the scallops, octopus, gazpacho but not a lot else. 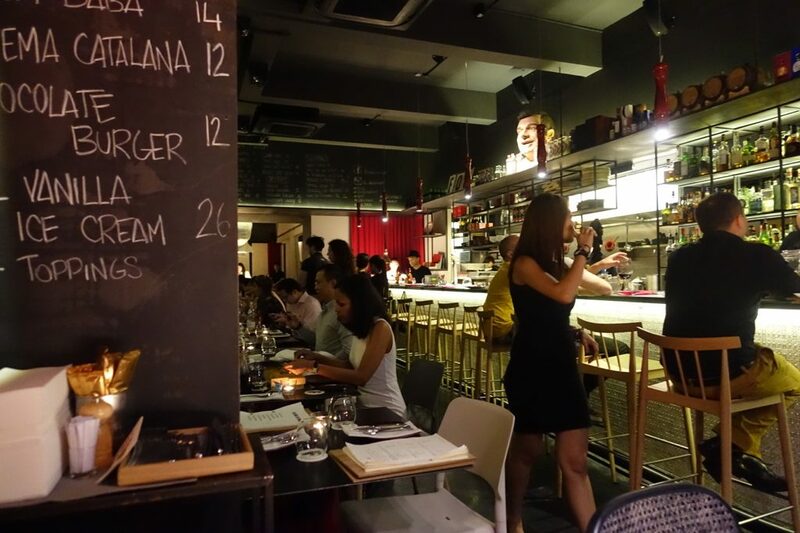 ← Geylang Clay Pot Rice – Singapore – What’s all the hype about?